Cook a Turkey In Your Gas Grill That's Flavorful and Juicy! There are lots of ways to cook a turkey, and gas grill smoking is just one method that will create a great looking, great tasting turkey for Thanksgiving. Or for any time of year. The following steps will give you what you need to make a good looking, great tasting whole grilled turkey. This works best when using a larger gas grill with multiple burners that can be controlled separately. It's also easiest if the burners are located on the left, right and center instead of in the front and the back. If frozen, thaw the turkey safely. That means thawing in the refrigerator (figure one day in the fridge for every 4 pounds of turkey), or thawing the turkey in a sink full of cold water. The ice cold turkey will keep the water chilled, and it can take as little as 6 hours to thaw, when it should be refrigerated until it's cooked. If the refrigerator method is used, cook the turkey within two days after it's thawed. If thawed in cold water, cook it by the next day. Remove the giblets and trim away the the extra skin and fat. Rinse it well in cold water. Something I do is remove the wing tips. They almost always burn, and there's nothing there to eat anyway. Chop 'em off and use them for stock or for flavoring the gravy. It's a good idea to brine a turkey before it's cooked, but it could also be marinated, injected with flavor, coated with a good dry rub, or simply seasoned with a little salt and pepper. Each seasoning method has its merits. When seasoned, place the turkey on a sturdy raised rack that's sitting in a solid baking pan. 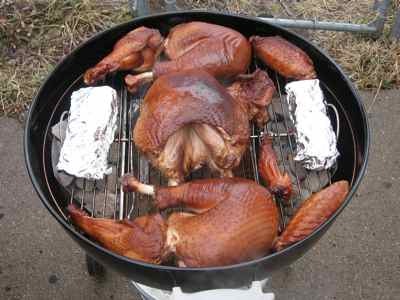 The pan catches all the juices and grease that drips from the turkey, keeping your grill clean and preventing flareups. A V-shaped rack, the type that sits in the large roasting pans, is a great accessory for smoking turkeys. Because of its shape the turkey can be placed breast side down without rolling onto its side. I attached a V-shaped rack to a shallow pan with copper wire. With the rack attached to the pan, it's more secure whenever I remove it (with the turkey still on the rack) to drain off excess grease and juices. 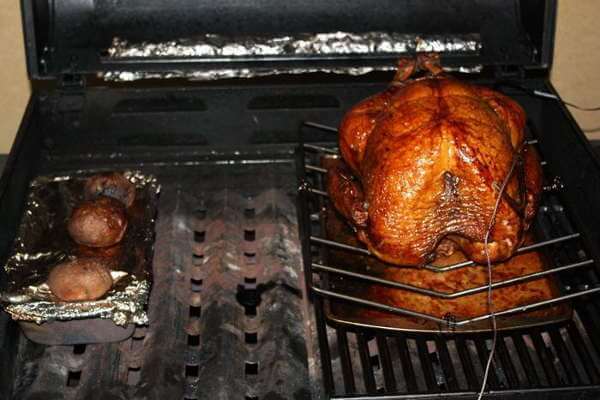 When grilling a turkey, should it be breast side up or breast side down? I start with the turkey breast side up for one to two hours, until the skin firms up and just begins to brown. Then I'll flip it over, cooking it breast down. When I think it's down the the last 1/2 hour of cooking, I'll flip it back to breast side up, which makes the skin become more crispy. Set up your grill for gas grill smoking. My grill has three burners. I leave the left burner on and the other two off. With the heat coming from one side, I have to rotate the turkey several times so each side cooks evenly. I've tried it with the two outer burners on and the middle burner off, but the spacing was too narrow. The sides of the turkey were exposed to nearly direct heat. If you have a larger grill, you might be able to grill with both the left AND the right burners on, putting the turkey in the middle. Set up like this, it probably wouldn't be necessary to rotate the turkey. Using two burners might make your grill too hot, and if that's the case, use just one. I remove the cooking grate that sits above the burner I use, because I can place the pan of smoke wood closer to the heat. And you may have to play with your grill a little to help it keep the temperature on an even keel. You'll see in the picture above that I stuffed wads of aluminum foil into the rotisserie cutout in the lid, and partially sealed up the rear ventilation slot. Turn on all of the burners and get the grill nice and hot, at least up to 400 degrees. By doing this, the turkey will get a good start when it's placed into the grill. A lot of the heat will be lost when the turkey is put in, but it will quickly stabilize at your desired temperature within the 250-300 degree range. Place a pan of your favorite smoker wood directly over the lit burner. Fruit woods and nut woods are good choices. Apple is my favorite, but cherry's good, too. Soaking the wood in water is not necessary. 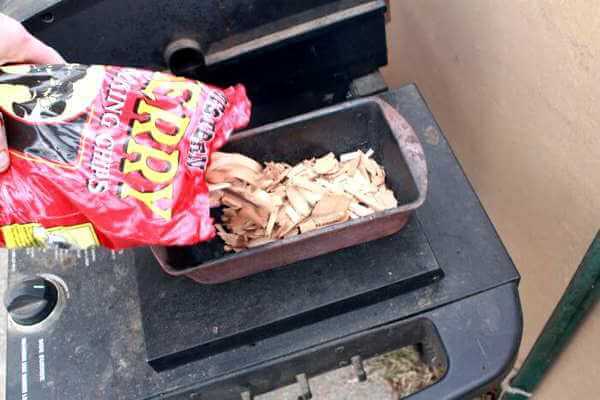 I use dry chips or chunks in my smoker wood pan, then crimp a layer of foil over the top. Punch a few exit holes for the smoke. Step 5 - Smoke That Turkey In Your Grill! Place the turkey on the cool side of the grill, and rotate it 180 degrees every 45 minutes to ensure even cooking. Start with the breast facing up for the first 1 to 2 hours, then turn the breast down, and continue cooking. Flip it back to breast up for the last half hour of cooking. I try to keep the grill temperature between 250 and 275 degrees. 250 is the very minimum I'd cook a turkey at. If you'd like to cook at over 300 degrees, that's fine. Just realize that there's more chance of burning, and the turkey will get done much more quickly. I've grilled turkeys at 400 degrees before, and they were great as long as the breast meat didn't overcook. One 12 pounder I grilled at that temperature took just 2-1/2 hours, start to finish! Lower grill temperatures are preferable when grill smoking turkeys. Smoke absorbs deeper into the meat when it's at a lower temperature, plus cooking at a lower temperature means more time in contact with smoke, meaning smokier tasting turkey. Again, rotate the bird occasionally for even cooking. Flipping it over helps in bringing the breast and the thighs and legs to their done temperature at the same time. Basting? I used to baste turkeys but not anymore. There's already enough fat in the turkey skin to do a good job of self basting. 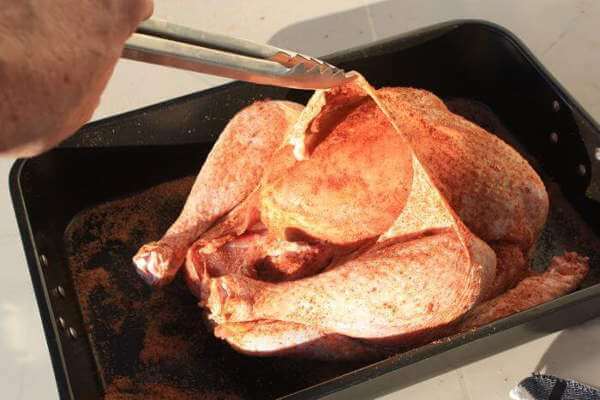 But if you still want to baste, go ahead - it won't hurt anything. And a butter baste will definitely add some nice flavor to the turkey skin. When Is That Gorgeous Grill Smoked Turkey Gonna Be Done? The Food Safety and Inspection Service branch of the USDA has recently made a change to their long standing previous done temperature recommendations. 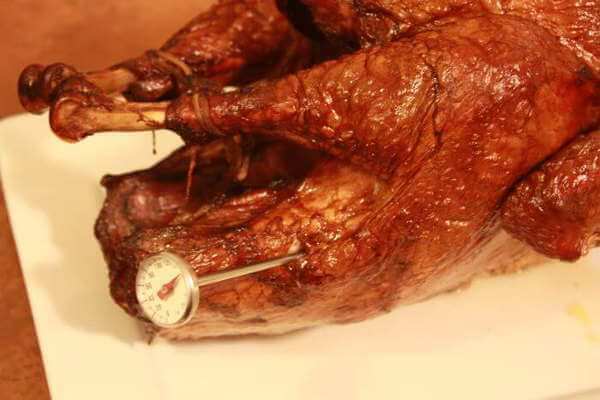 It used to be 170°F for the breast and 180°F for the thigh, but now the FSIS recommends that all parts of the turkey have to reach just 165° Fahrenheit in order to be safe. Grilling a whole turkey so that the white meat and dark meat are done perfectly can be difficult, but there are some techniques that will make the process easier. The difficulty in grilling or grill-smoking a whole turkey is bringing the breast meat and the dark meat to the perfect turkey done temperature at the same time. 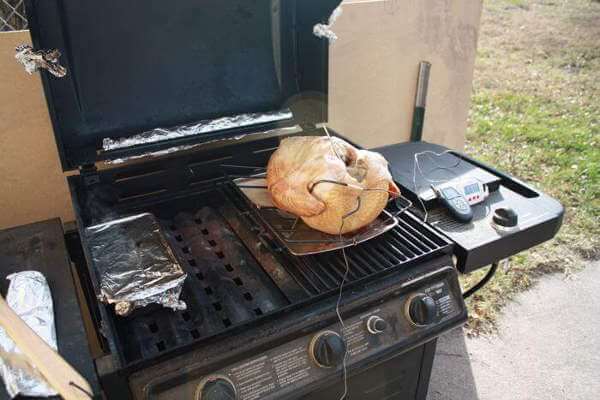 I often use two remote thermometers when I cook turkey in a gas grill, with one probe in the breast and another in a thigh. That makes it easy to keep track of the internal temperatures without opening the grill. A whole grilled turkey looks great, but cooking it perfectly can take some work, what with the rotating and flipping and all that stuff. The easiest, most sure way to grill perfect turkey is to separate the breast section, wings and the leg quarters from the back and cook them all separately. The smaller sections cook more evenly and more quickly. The pieces can be moved around to warmer or cooler parts of the grill as needed. And if you're grill-smoking, the separated sections take on a smokier flavor because there's more surface are exposed. If showing off a beautifully browned, whole grilled turkey isn't at the top of your "important things to do" list, try separating one before it's grilled and see how you like it. Whether you cook turkey in a gas grill with or without smoke, whole or divided into sections, you can be pretty darned sure it will taste great.